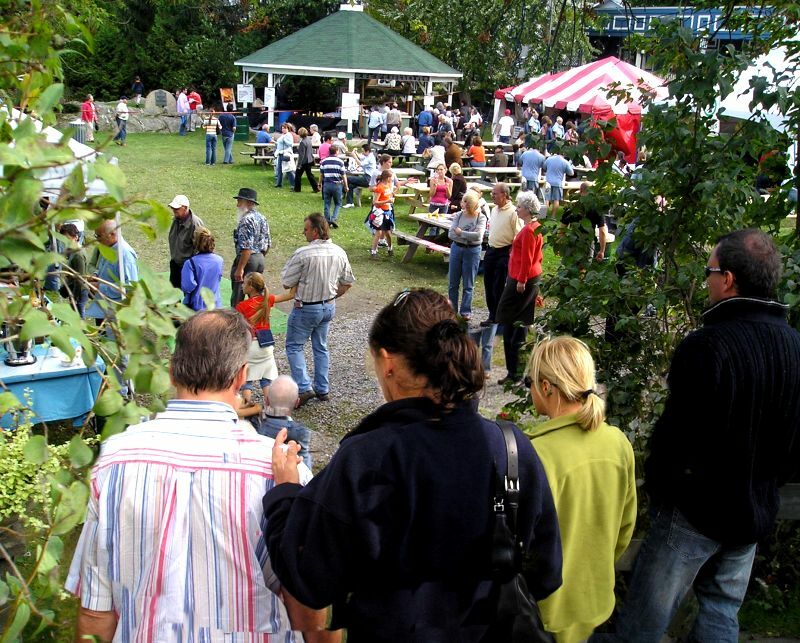 The Brome Lake Duck Festival started the first week-end of the two week-end 2006 edition with much anticipation and planning finally turning into reality. Saturday started with what may be considered perfect weather...perfect for ducks! While the rains fell on the sparse crowds in ColdBrook Park and most of the picnic tables were empty except for pools of water the tents that were set-up around town were great spots to stop and stay dry and enjoy a sip of a new wine or to have a taste of a duck brochette. The musical entertainment was courageous to find their muse in the cool damp air but still the sounds of songs filled the air! The dress-code of the day was indeed raingear-yellow which was almost fitting as the festival-goers who trotted up the Lakeside hill looked like plump ducks going for walkies! 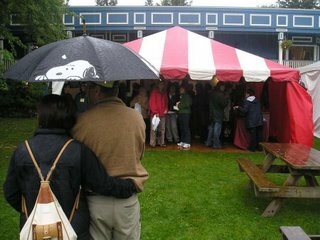 While the rains may have dampened some spirits there were still a hearty few who decided that no wet winds were going to spoil a taste of fine duck cuisine! Sunday, the skies cleared and by early afternoon on Sunday the streets were full of windowshoppers and folks simply enjoying the bright colors and sounds of the duck fest. Sunday turned out to be a fantastic day at the Festival with a crisp wind blowing the gorgeous red and orange leaves into the bright blue sky. The splashing water spilling over the Coldbrook dam mixed with the sounds of the cheery accordian player and piano music drifting down from in front of the Star Cafe. The park was full as the weather allowed familes to come out in force to taste the food and enjoy the arts and crafts exhibitions. 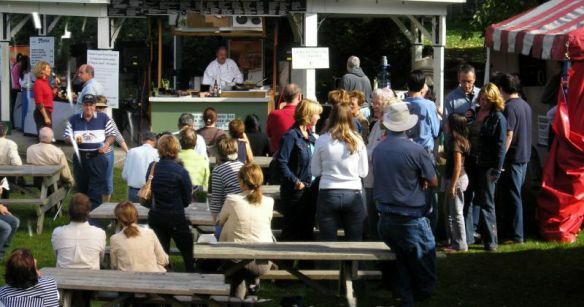 The Brome Lake Duck farm helped sponsor some wonderful cooking demonstrations to the crowds on Sunday in the park. The accordian player strolled through the village while master chefs demonstrated some of the finer points in the art of cooking with duck. 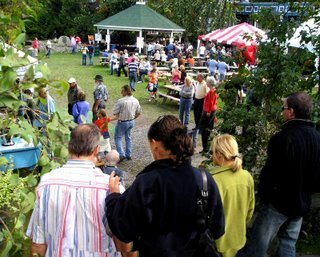 The shops and restaurants were full and the shuttle bus was giving free rides to the Brome Lake Duck Farm as curious visitors browsed through the village. The brief showers at the end of day only added a bit more excitement to the event and by then, with a belly full of duck and a few glasses of wine, no-one seemed to mind a bit! The last halk of the Knowlton Duck Festival and the Big Duck Race takes place September 30th and October 1st. We're all looking forward to next week-end for the second part of the Knowlton Duck Fest and the Big Duck Race. Get Quackin'! Back to School: Watch Out For Our Kids!